While highly ideological members of Congress tend to use their Facebook posts to criticize political opponents and support their allies, moderate lawmakers are more likely to concentrate on local issues in their outreach on the platform, according to a new Pew Research Center analysis covering Jan. 1, 2015, to Dec. 31, 2017. For the average moderate legislator – that is, those in the middle 20% of all members based on the DW-NOMINATE ideology measure – about 54% of a member’s Facebook posts discussed places, groups, individuals or events in the politician’s state or district. But for the average very liberal or very conservative legislator (that is, among the 10% most liberal or 10% most conservative members by the same measure), just 38% of posts dealt with local issues. 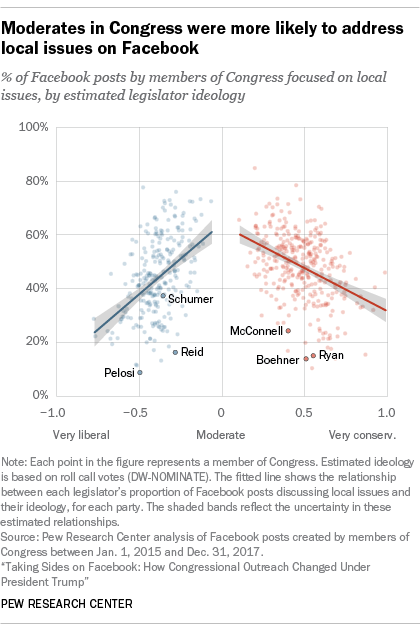 Instead, those very liberal and very conservative members were especially likely to express opposition toward their political adversaries and support for other members of their own party. Party leaders were especially unlikely to use Facebook to communicate about subjects related to their home states and districts. For the average Senate and House majority and minority leader across the 114th and 115th Congress, just 19% of posts discussed local issues. House Minority Leader Nancy Pelosi discussed local issues in just 9% of her Facebook posts, while House Speaker Paul Ryan did so in 15% of his posts. By contrast, the average non-leader’s posts talked about local issues and events 47% of the time. There was also a gap between the two chambers when it came to discussing local topics: The average senator did so in 41% of posts, compared with 47% for the average House representative. And newer members tended to post about their own states and districts more often than those with a longer tenure in Congress. The average member who had served two terms or less mentioned local topics in 49% of posts, compared with a rate of 44% for members who had served four or more terms. Note: See full methodology here.